Condor Outdoor 7 Pocket Chest Rig | BUDK.com - Knives & Swords At The Lowest Prices! 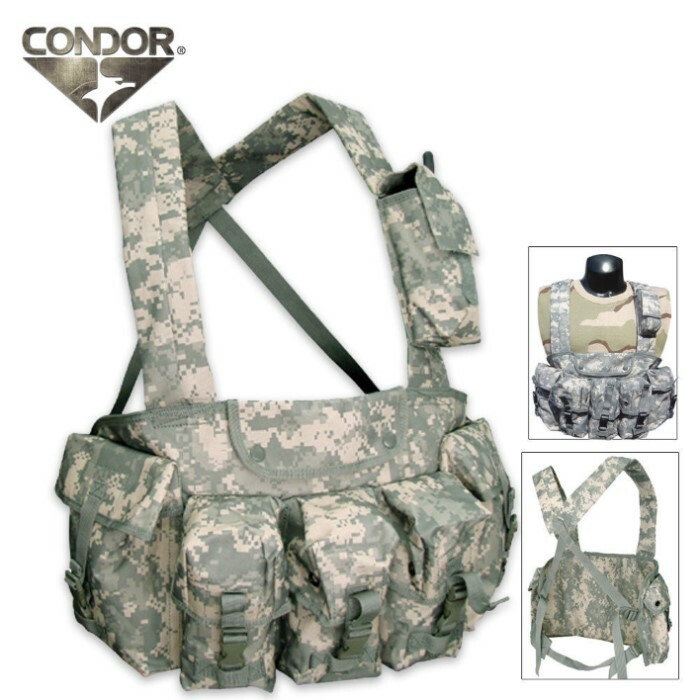 This GI-style, military grade Condor Outdoor 7 Pocket Chest Rig gives you the convenience and storage you need without weighing you down! With 3 magazine pouches, 2 large accessory pouches, a large internal map pocket and shoulder strap pockets, you will need to buy more accessories to fill up this chest rig! All components of this chest rig are fully adjustable and have an adjustable quick release waist belt. Pretty cheap, but the quality is pretty good, the pouches are sturdy and can take considerable weight, a good buy for airsoft enthusiasts looking to carry all they need in a match, and its lightweight.